Michael Arrington got to see the new Yahoo! Photos which immediately shows you how the Oddpost library is kicking in (e.g. it looks like new Yahoo! Mail). We also see the cross-polination from another Yahoo! purchas, Flickr. So all in all, Yahoo! Photos looks like it has the Ajaxiness of Oddpost, and the Web 2.0-iness of Flickr. But what most people donâ€™t know (I didnâ€™t) is that around 30 million unique monthly visitors come to Yahoo Photos (the other Yahoo photo service) v. about 8 million on Flickr. Flickr has mind share; Yahoo Photos is driving real (unique) traffic. So, why is yahoo continuing to develop Y! photos if they’ve already got the #1 photo sharing site in Flickr? Ok, after reading the actual article, I withdraw my last comment. It still seems like they should integrate, however I’d hate to see Flickr get muddied by a merge. 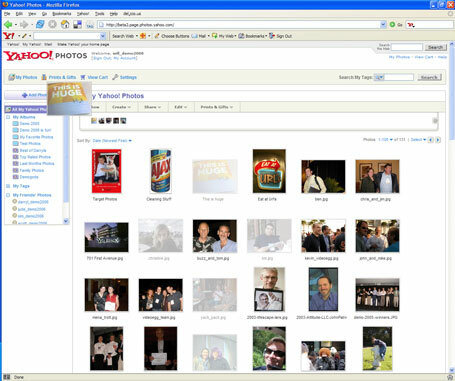 A friend recently moved from Yahoo to Flickr, but couldn’t transfer between them. If I were Yahoo (that’ll be the day) I’d consider using the Flickr API to power Yahoo Photos…. then they could be combined technically, but have split interfaces. I love the image resize effect when dragged, and the show only the images which are visable part. Like Yahoo! Mail i am anxious to see this live. When will we see this new version of Yahoo! Photos?